I actually finished the main body of the shrug tonight at knit night, so it just needs a bit of sewing up and ribbing along the edge (by someone else, since I’m going on vacay so soon! really need to start packing). 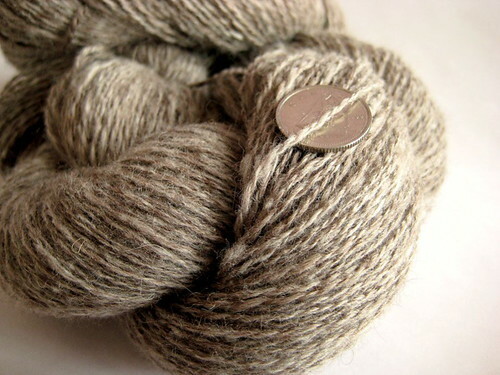 Speaking of glamour shots…here’s some of the latest handspun. Beauuuutiful polwarth/alpaca/angora, I think it was from Spirit Trail, purchase at Rhinebeck. I spun it up quite thin, although there are more than a few little lumpy bits that weren’t totally blended in – I find them charming. Came out to about 488 yards in 2 oz, definitely enough for something lacey and light. 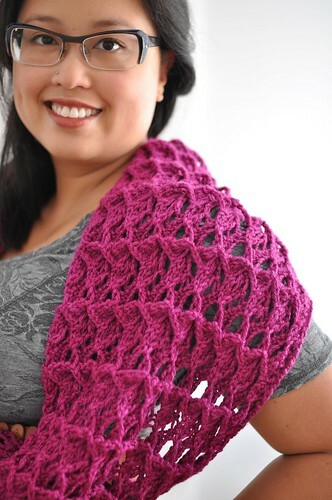 Maybe a swallowtail shawl? Haven’t tried that one yet. Trying to dole out the blog fodder over a couple days! More soon, including a new project or two…I seem to be having some startitis issues! I’m definitely lovin’ the greenery. Gah! I just posted about you people!! How do you DO that? 480 yds. out of 2 oz??? You must be messing with the order of time and space! I love that colour of green – it looks so lush. Wow. That green is delicious! I want some! That is a scrumptious green! Totally appropriate for your recent gardening! Just a note, of all the veggies in our garden, I’ve found the tomatoes and snow peas to be the most worth it – so pricey in the store, so much tastier when grown organically at home! Beautiful green! I’ve been having startitis too, but I think I’ve got it under control now. Plus, I loved the garden pictures. Hope to see more later. That’s one of the prettiest green colourways I’ve ever seen, and I’m a bit of a green nut. The handspun is very nice too, and would make a lovely Swallowtail, kind of like the wings of a mourning dove. 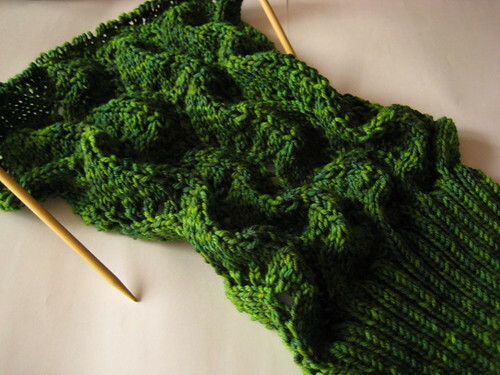 Forget the yarn (although it’s lovely)–I’m coveting those close-ups! How the heck do you get such clear shots? My closeups always look like I took them drunk and in the dark–which may be true on occasion, but not every time. Very pretty green indeed! I hope your vacation will be somewhere warm and lovely. Oooooooooooh. I love me some nice green. It’s really gorgoeus! green was always a meh color for me. but then there came a flurry of GREEN in blogland lately and i think i’m falling in love! What is that green yarn? It’s lovely! I love the green shrug! Gorgeous shots, all of them (what kind of camera?). And the knitting – stunning, as always. That first shot of the shrug is divine! I want to jump in! I’ve become more drawn to green in the last few months/year or so – and the detail shot you have is gorgeous. It looks like an aerial shot of a forested series of mountaintops. TAG! You’re it. Visit my blog for the rules if you want to play. Wow, that green is just gorgeous! That green is stunning! I’m absolutely smitten. 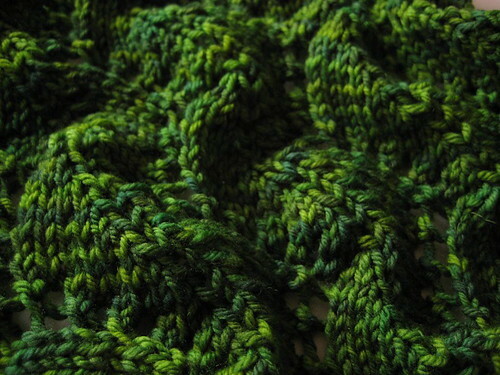 That green yarn is GORGEOUS! I want some! Even if my stash doth protest, I WANT SOME.